With the exception of about 40 blessed miles of newly paved road, the 227 miles I drove today was as damaged and bone jarring as yesterday. Forget Mr. Toad’s Wild Ride, it felt like I was on something that was a cross between a jack hammer and a rocking horse and I won’t even bother to mention the headwind. With my whole rig weighing in at about 28,000 lbs over a length of 56.5 feet, you can imagine my relief when I pulled into the campground and shut down the engine. I don’t think the Ice Road Truckers have anything on me. Ha! Fortunately the roads are to improve drastically within the first hour of driving tomorrow, so I can hopefully stop talking about them, which I’m sure will be a relief to all of us. The scenery today was lovely. We paralleled the St. Elias Range of mountains for much of the day along with many river valleys and the braided rivers lying within. After such a rainy summer in Anchorage, it is so nice to see the sun. 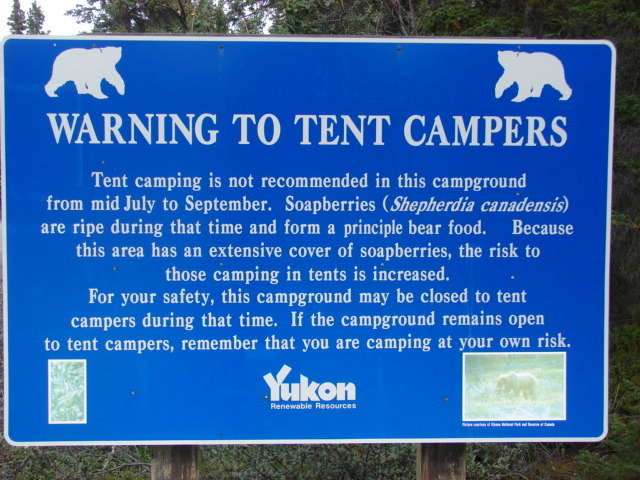 We are camping at the very acceptable Congdon Creek Campground on the shore of Kluane Lake, the largest lake in Yukon Territory. The wind has it whipped into a froth, but the hounds and I enjoyed a walk along its shores nonetheless. Lucky for us, our campsite is tucked back in the woods and out of the wind. A sign posted near the entrance made me think of the recent and unfortunate bear maulings in Yellowstone. I’m sure glad Dora isn’t a tent, but I’ve got my bear spray handy anyway. Shhhhhh, don’t tell anyone I have bearspray because it is illegal in Canada. 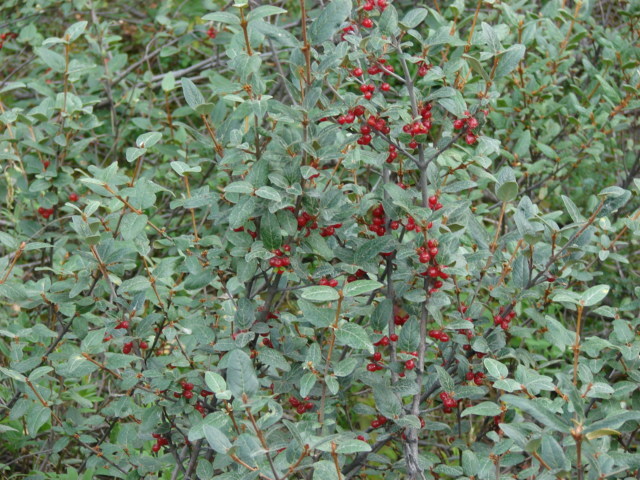 While walking the dogs I sure did notice a great many soapberries as well as a great many soapberry bushes which are missing their soapberries. I guess the sign is right. It’s off down the road tomorrow with two stops on the agenda. Haines Junction is first and White Horse is second. They both have internet, so perhaps I’ll get to post these blog entries. 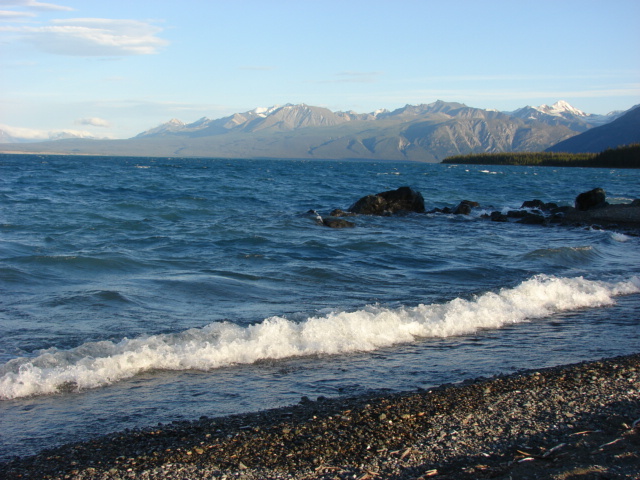 You can see the wind had Kluane Lake looking more like an ocean.